Beat eggs, milk and butter together and season with salt and pepper. Pour egg mixture into a rectangular baking dish. 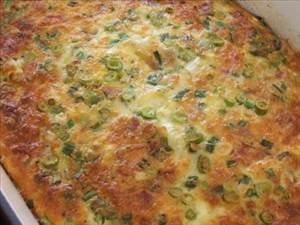 Sprinkle chicken, cheese and spring onion evenly on top of egg mixture. Bake in the oven 30-40 minutes or until egg is set in middle. Note: good basic recipe that can be changed to suit tastes. Substitute chicken with ham, bacon, chorizo or salami and add grated vegetables, sliced mushrooms and fresh chopped herbs. There are 291 calories in 1 serving of Chicken & Cheese Frittata. Calorie Breakdown: 62% fat, 5% carbs, 33% prot.